At the halfway point of the year, 2017 remains the second-hottest year to date—a surprise given the demise of the El Niño that helped boost temperatures to record levels last year. The continued near-record warmth is a marker of just how much global temperatures have risen thanks to the greenhouse gases accumulating in the atmosphere from fossil fuel use. Odds are good that 2017 will end as the 2nd-hottest year on record—so far. While there were several spots that have seen record-warm years so far—including Mexico, parts of eastern Russia and China and western Europe—the heat is fairly broadly spread around the globe. Wherever its final rank ends up, 2017 will almost certainly be hot enough to knock 1998—the only remaining 20th century year among the top 10 warmest—down another spot, to No. 9 in NOAA’s rankings. 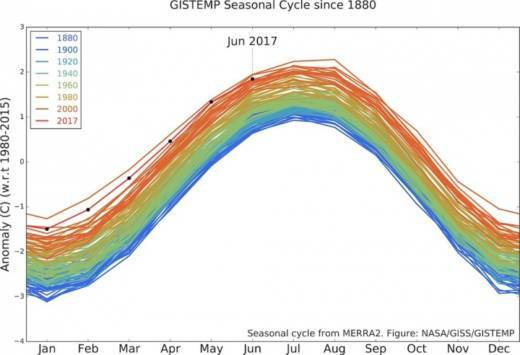 If the streak of very warm years continues, “I wouldn't be surprised if the next two to three years we would see '98 drop out of the top 10 warmest years on record,” she said.